Hiya crafty peeps! 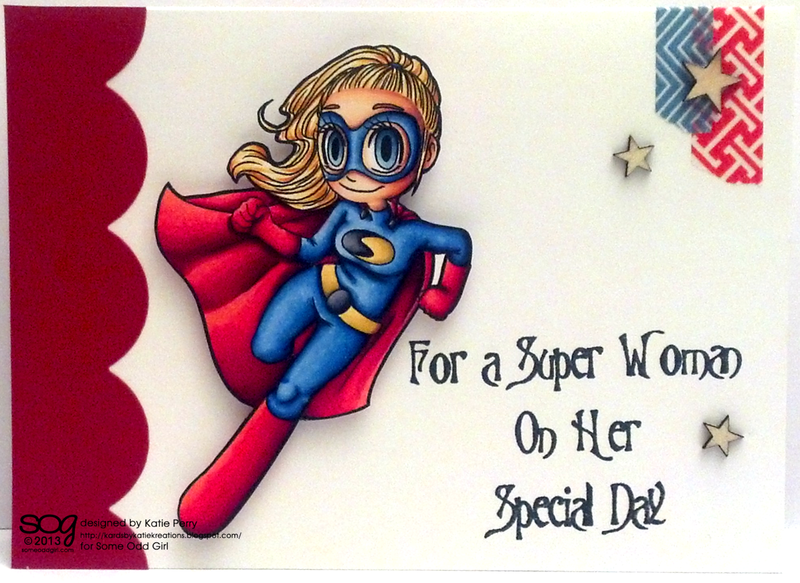 Its Tuesday which means that there's a new digi release over at Some Odd Girl and this image is perfect for those Super Women in your lives- meet Super Mae! I loved coloring her up in the traditional Super Girl colors with my Copics. I ended up keeping this card pretty clean and simple- mostly because I couldn't find the right paper in my stash for what I was thinking in my head :) But the crowning piece for me was the sentiment! I picked this stamp up at a garage sale about 5 years ago and have no idea what company it's from but this baby has made it through craft purges and moves because I always find myself reaching for it! I hope you love Super Mae as much as I do- don't forget to pop on over to the store if you want to grab her for yourself. Thanks so much for stopping by to visit my little space in blogland! Super card Katie! ;) Love the whole thing, it totally reminds me of Super Girl (and I loved that movie!). She is bad-a**!! What a great super hero chick!! Fantastic coloring job!!! Woooooow! Terrific card! Love how you colored her (as always) :) and that sentiment is just fab!! Gorgeous card Katie. Love the cas style and how you added stars.